The recent epic fundraiser for the Lyla Nsouli Foundation has so far raised over £90,000 for research into treating a rare form of brain cancer. 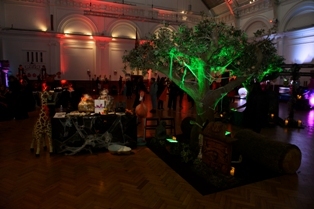 This fabulous party staged purely for children saw 700 guests at the Lindley Hall, Royal Horticultural Halls in Westminster. Production company Event Prop Hire pulled out all the stops for the event ensuring it was totally immersive as the pictures testify. 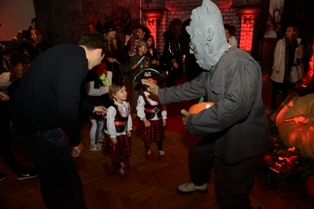 Nearly 700 guests attended the 3-hour event which featured spooktacular entertainment with headless waiters, super tall balloon-bending witches, snake charmers, a hanging dracula from Holland and even a Michael Jackson (lookalike) doing Thriller. There were plenty of activities too from cookie and cake decorating, face-painting and dancing, ball pools and experiment stalls to keep everyone busy. Candy floss and Candy Kittens were also in order to keep the momentum high. The Foundation has already given several large grants into the treatment of Diffuse Intrinsic Pontine Glioma a rare brain cancer, which is inoperable and has a median 9 months of survival from diagnosis. The latest grant of £244,000 has allowed trials of a pioneering form of Convection Enhanced Delivery which allows drugs to be delivered directly to the tumour without harming the rest of the body. They have already made strides in their work by extending and improving the lives of the children they are treating. Each year DIPG claims the lives of 30/40 children.